Albert Leung (born 7 December 1961), whose pen name is Lin Xi (林夕), is a prolific and award-winning lyricist based in Hong Kong. He was educated at the boys school Chan Sui Ki (La Salle) College and La Salle College, and graduated from the University of Hong Kong in 1984. He has been a Cantopop lyricist since 1985, using the pen name Lin Xi. The Chinese characters for this name, 林夕, written vertically, look like the compound (simplified) character 梦 (pinyin: mèng), meaning "dream". He has written over 2500 song lyrics. He is well known for composing lyrics very quickly. 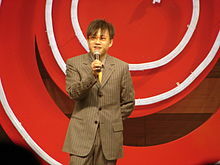 On TVB's show Be My Guest, he admitted that his fastest record for writing the complete lyrics to a song is 45 minutes. His most noted songwriting partnership is with composer Zhang Ya Dong for Faye Wong, but he has also written with Leslie Cheung, Andy Lau, Miriam Yeung and many others. He composed the lyrics to the song "Beijing Welcomes You", a six-minute song which was performed for the 2008 Beijing Olympics by a panoply of popular Chinese singers, and which proved extremely popular with the Chinese public. In May 2009 he published a book about his creative work in the previous decade, 曾经—林夕90前后 ('Once–Lin Xi's 1990s from beginning to end'). ^ Hanwang: Why is "Beijing Welcomes You" so popular? This Hong Kong biographical article is a stub. You can help Wikipedia by expanding it.